In his book, Robert Cialdini uncovered 6 Universal Principles of Persuasion. Shortcuts that our brain uses to make decisions, or in Cialdini’s words shortcuts that make people ‘say yes.’ What makes the work of Prof. Cialdini so interesting is that he shows influence at work. He translates scientific research in the area of behavioural design and human psychology into practical business applications. His widely acclaimed studies are highly instructive to those who want to be more influential. In this post, you’ll find a series of videos in which Robert Cialdini explains the persuasion principles himself on various business conferences. It’s, therefore, a showcase how broadly his thinking can be used in practice. “People say yes to those who have given to them first.” In this short 3.16 minute video, Cialdini tells about the social norm that exists across cultures that explains why the reciprocity principle helps to influence people’s behaviour. Who would think that remembering someone’s birthday could be so important if you want people to remember yours? You’ll know after watching this video. To summarize: give what you want to receive. If a colleague needs help, and you can ‘lend’ him one of your team members, you’ll get his help later. People want to have what is scarce. How can you use this in daily business? There have been several examples of the scarcity principle working simply by saying something will be limited. There’s been an example that when British Airways announced that they would no longer fly to London – New York twice a week with the Concorde as too little passengers were using the service, sales took off the next day. Nothing changed about the Concorde, it became scarce and therefore wanted. Don’t assume your expertise is self-evident. Instead, establish your expertise before doing business with new team members or clients. In conversations before a meeting, describe how you solved a problem similar to the one on the agenda. Get them to put in as much effort as possible, so that they’ll perceive the results as more worthwhile. “The number one rule of sales is to get your customer to like you. That’s true, but I am going to give it the status of the number two rule of sales. Here’s the number one rule in my view. It is not to get your customer to like you; it’s come to like your customer”. This is how Cialdini starts his keynote speech on the Australasian Real Estate Conference. Watch this 4.46-minute video, and you’ll know exactly what Cialdini sees as the psychology of persuasion when talking about the persuasion principle ‘liking’ and how you can use it to boost sales. How do you get to like your customer, client, patient or user? By using the same tools, you can use for them to like you. You try to discover similarities. If you find something about someone you truly admire, you are going to like that person more. It’s all about having empathy. 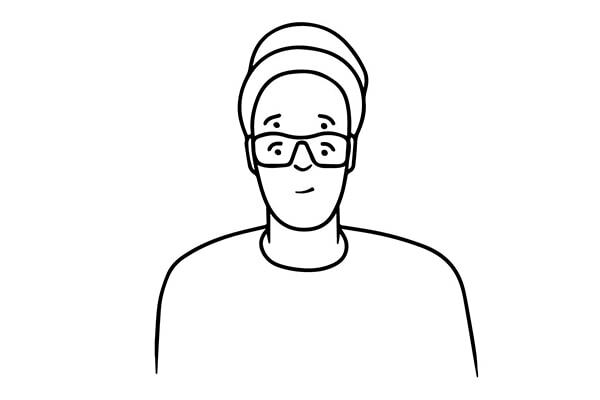 The key skill every behavioural designer should have. But it has to be genuine. It has to be true. This is how you can make sure you’ll find a genuine reason to like your ‘public.’ Cialdini explains this in this 5.02-minute video. In short: to influence people, win friends through similarity. Create any bonds with peers, bosses and direct reports by informally discovering interests. 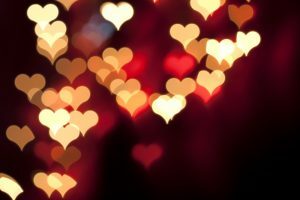 And praise: charm and disarm, make positive remarks about others. People follow what those around them are doing. In this video, Cialdini explains the principle of social proof. He uses the case about reusing towels in hotels. What’s very interesting is that he makes a clear distinction between cooperation and social proof. Want to know why cooperation didn’t work, and social proof did? What’s this 6.01-minute video taken on a pharmaceutical conference in Las Vegas. And to add on to this, a very short video (0.55 minutes) in which Cialdini explains the door hanger experiment, that showed how social proof could help people save energy. How can you use social proof in another way? Use peer power. For example, ask an esteemed ‘old timer’ in your company to support your new initiative or plan. Excerpt: In this post, we will introduce you to the work of Dr. Robert Cialdini, who is an expert on how to influence people and the psychology of persuasion. In his bestselling book, ‘Influence‘ Cialdini identifies six principles of persuasion and explains the psychology of why people say “yes”—and how to apply these understandings in real life. This isn’t so much an article, but a reference post for anyone who wants a quick overview of Cialdini’s work on the persuasion principles or wants to reread one of them. That’s why we’ve have divided this post into sections, so you can easily jump to the subject of your interest. Robert Cialdini’s work can be considered as adding on to the work of Daniel Kahneman. Kahneman discovered what laid the foundation in all thinking about behavioural psychology and behavioural economics. 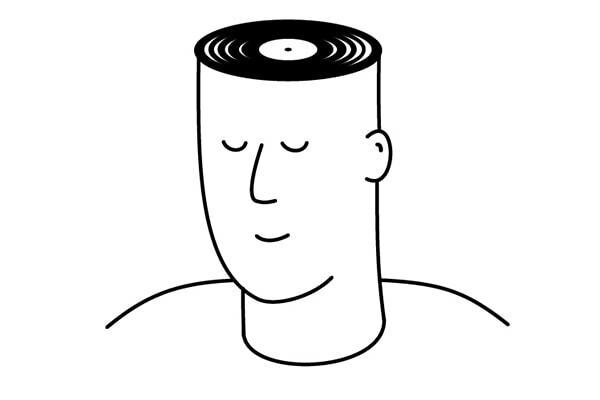 Where we use to think we all rational thinking human-beings using information at hand to make a decision, for the most part, we rely on emotional thinking. The majority of our choices are automatic and based on so-called shortcuts. When using these shortcuts, Robert Cialdini states you can make people say ‘yes’ to about anything. Also called persuasion: the action or process of persuading someone or of being persuaded to do or believe something. That’s also the reason why he stresses to employ the persuasion principles an ethical manner. Which is something we can only stress once more. Behavioural science is a powerful tool. If you know how people think, and how they make decisions, you can influence their behaviour. Our company mission is to unlock the power of behavioural psychology to nudge people into making more positive choices in work, life, and play. We help people grow through change. And true change is all about behaviour. You have to stop doing the things that hold you back, and you have to start doing the things that will propel you forward. Why we love the work of Cialdini is that he brought the psychology of influence into practice, like ethical sales, marketing, management, and business applications. He explains the psychology of why people say ‘yes—and how to apply these understandings in daily life. Cialdini ‘s 6 Universal Principles of Influence were based on three “undercover” years applying for and training at used car dealerships, fund-raising organizations, and telemarketing firms to observe real-life situations of persuasion. 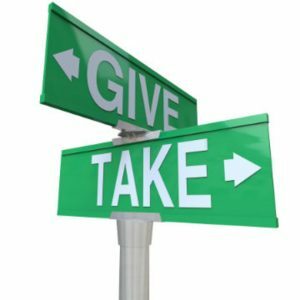 The reciprocation rule essentially states that if someone gives something to us, we feel obligated to repay that debt. Could be we give back to others in the form of behaviour, a gift, or service. Key to using the Principle of Reciprocity is to be the first to give and to ensure that what you give is personalized and unexpected. In his book, Cialdini illustrates this principle with an example you have probably have experienced yourself: the fact you get candy or peppermint with your restaurant bill. They have done a series of experiments in restaurants with to see if this phenomenon of giving a little gift together with the bill had any effect in influencing the amount of tip given (obligation to do something back). This is what happened. When a single mint was given with the bill and the end of a meal, tipping amounts generally rose with 3%. Interestingly, if the gift is doubled and two mints are giving, tips don’t double, but they quadruple to a 14% increase in tips. What turned out to be the most effective in influencing people using reciprocity? If the waiter gives one mint, starts to walk away from the table, but pauses, he turns back and says, “For you nice people, here’s an extra mint,” tips go through the roof. A 23% increase, influenced not by what was given, but how it was given. It feels personalized, and it’s unexpected. You can imagine that using the principle of reciprocity can also improve sales effectiveness. Most of the times we’re not aware how the principles of influence work, but they drive how we make choices, and it once again shows the power of the subconscious mind Kahneman has illustrated so beautifully. People want more of those things they can have less of. That’s why you see so many websites using cues that stress the scarcity of a product or service. Deal times that are running out, the number of rooms left, only two days to go, etc. Time pressure enhances the feeling of scarcity. And it even increases the perceived value of things. When it comes to effectively persuading others using the scarcity principle, it’s not enough to tell people about the benefits they’ll gain if they choose your product or service. You’ll also need to be very clear about what is unique about your proposal and what they stand to lose if they don’t buy your product or service. This is the idea that people follow the lead of credible, knowledgeable experts. What Cialdini tells us is that it’s important to signal to others what makes you a credible, knowledgeable authority before you make your influence attempt. That can be done in different ways. 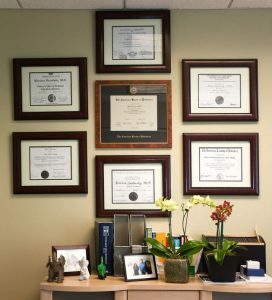 Diplomas on your wall help, wearing a uniform also does the trick and being introduced to someone as an expert does work too. In his book, Cialdini discusses and example of authority on his website this that is very interesting (the example is directly taken from his website). A group of real estate agents was able to increase both the number of property appraisals and the number of contracts by making sure the reception staff who answered customer phone calls to first mention their colleagues’ credentials and expertise. So, people interested in letting a property were told “Lettings? Let me connect you with Sandra, who has over 15 years’ experience letting properties in this area.” Customers who wanted more information about selling properties were told “Speak to Peter, our head of sales. He has over 20 years’ experience selling properties. I’ll put you through now.” This is designing a customer experience that is actually behaviour driven design that can boost your sales. People like to be consistent with the things they have previously said or done. If you did A, you are inclined to do A (and not B). This has to do with the fact that our brain is always looking to reduce our mental stress. And it’s less stressful for our brain to be consistent. Daniel Kahneman has explained in-depth how this works in our brain if you want to know more about this check out this post. How can you use this in influence people? If you can get someone to do, preferably a public or written, commitment to something your chances of influencing that person raise dramatically. Easier said if you can make someone say ‘yes’ to something it works wonders. An example. People who are conducting street interviews. If they would stop someone on the street, and first ask them ‘Do you consider yourself to be a helpful person?”. And if people say ‘yes,’ they then asked them, would you mind filling in this questionnaire for me? Compliance rates rose from 27% to 70%. People wanted to be consistent with their first answer. In other words, you can change attitudes towards something by using this principle of consistency. Cialdini gives another example of commitment in his book. In a study, they found out that the number of missed appointments at health centers was reduced by 18% simply by asking the patients themselves to write down appointment details on the appointment card (instead of the doctor assistants who would normally do this). In short, you can behavioural design the perception of yourself by using the principle of liking. Social proof is a psychological and social phenomenon where people assume the actions of others in an attempt to reflect correct behaviour in a given situation. Social proof is considered prominent in ambiguous social situations where people are unable to determine the appropriate mode of behaviour and is driven by the assumption that the surrounding people possess more knowledge about the current situation (Wikipedia). Or as Dr. Cialdini puts it “Especially when people are uncertain, people will look to the actions and behaviours of others to determine their own”. Telling people the number of people that have already bought your product, or the number of people that were happy with your service works. But you can also design behaviour by referring to others who were in a similar situation as the person you are trying to influence. A well-known example is the research on towel re-usage in hotel rooms. 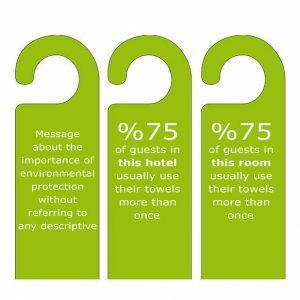 By doing one small addition on the little information card that can be found in the hotel rooms stating that ‘75% of people staying in this room, reused their towels’ the towel re-usage rate increased with 33%. 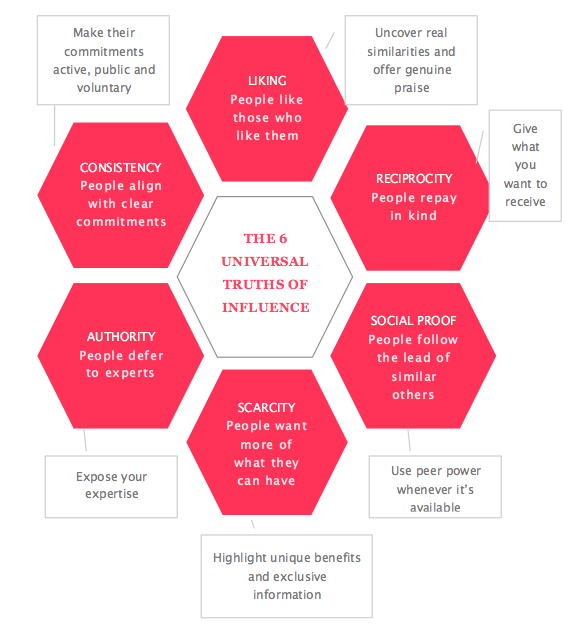 We’ve made an overview of the six universal principles of influence and joined them with the way you could apply them. Hopefully giving you a bird’s eye view on how to use the principles to influence people. We use the principles in combination with BJ Fogg’s Behavior model to boost motivation and ability. We have also made an overview of the more practical usage of the principles in daily life and business.